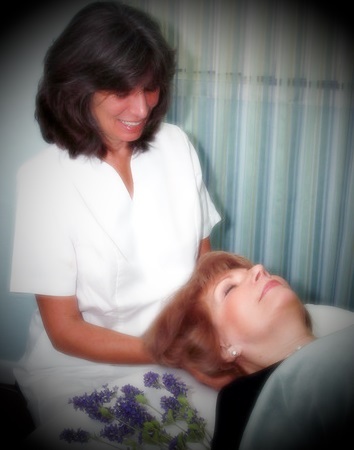 CranioSacral Therapy is a gentle bodywork technique, a hands-on method for enhancing the body’s own healing capabilities through balancing the craniosacral rhythm. Everyone has several kinds of rhythms in their body. There is the cardiac rhythm, in which the heart beats 60-80 times per minute to circulate blood through the whole body. Then there is the respiratory rhythm of your breathing, in which you inhale and exhale 15-20 times per minute to add oxygen to your blood. There is also a very delicate rhythm called the craniosacral rhythm, which 6-12 times per minute expands and narrows the bones of your scull and gently shortens and lengthens your spine in order to exchange and circulate the cerebrospinal fluid. This fluid surrounds and protects your brain inside your head and the spinal cord in your back from severe injury (e.g. when you fall). The cardiac rhythm can be felt at the neck, wrist and ankles. The rhythm of the lungs can be felt at the shoulder, neck, chest and belly. And the craniosacral rhythm can be felt all over the body. It’s a very subtle movement that can only be detected by a very soft touch. What can cause the craniosacral rhythm to be out of balance? Any form of physical impact, no matter if caused by an injury, accident or stress-related tension, as well as emotional trauma can disturb the craniosacral system and keep it from working properly. For a CranioSacral Therapy session you are lying fully clothed on your back on a massage table. There is no massage or use of oil involved. I will check your cranial rhythm, which means I’m looking to detect the movement of that contraction and expansion, starting at your feet, then moving on to your knees, hips, shoulders, and then to the head. I will cup your head in my hands, gently holding and waiting for a response from your body. At any point during the session, tension patterns that are restricting the flow of rhythm may spontaneously “let go” or release. Releases occur in the form of heat, pulsing or muscle twitching. Sometimes the eyes might blink or flutter or your tummy starts gurgling. You may feel muscles soften or a shift in energy, your breathing pattern may change to a slower, deeper pace. A profound feeling of relaxation is the most common reaction to CranioSacral Therapy. CranioSacral Therapy is well known and documented for its multiple applications and positive results in thousands of cases. The Upledger Institute, dedicated to the research of CranioSacral Therapy has a website with numerous case studies (www.upledger.com). CranioSacral Therapy is also preventative in nature: It supports and strengthens the body’s immune system to keep it from getting sick. It offers deep relaxation, stress reduction, increased energy, improved vitality and mental clarity. In addition to the many physical benefits, CranioSacral Therapy allows you to feel the connection between the mind and the body and experience a sense of peace and well-being.